With the release of the new Alpinestars Raider Drystar Pants, Astars will have you covered for the uncertain conditions of the Fall season with the creature comforts and attention to detail riders desire from technical riding pants. The Raider Drystar Pants will feature a multi- fabric shell for increased abrasion resistance in impact-prone areas, as well as CE certified knee armor and PE comfort padding at the hips. The pants will have a pre-curved construction with long length zippers at the lower cuff to fit well with almost any style of boot available. A fixed Drystar Waterproof Membrane will keep riders dry at all times, and in fair weather conditions, long length zippers at the thighs will allow for direct airflow to keep riders cool. 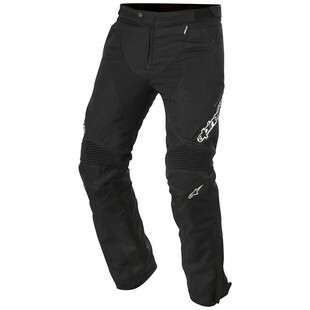 Like many other Alpinestars Pants, the Raider Pants will feature a connection zipper that matches up to an equally technical riding jacket from Alpinestars. The Raider Drystar Pants will be a great addition to almost any rider out there for commuting, sport touring, and adventure riding. Comfort is at the forefront with vast amounts of adjustability and stretch panels, without a compromise in safety features.